Last February, the capital of the Czech Republic held the festival Film Music Prague, and Gorka Oteiza (SoundTrackFest), who attended it from February 1 to 4, 2019, tells us in this special article how was this 8th edition. 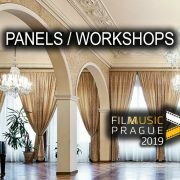 NOTE: You can find detailed information about the festival’s concert program in the following link (read news) and complete information about the panels/masterclasses activities in the following link (read news). On Friday, February 1st, 2019, Film Music Prague festival began, which offered a total of 4 days full of concerts and events related to film music until Monday, February 4th. 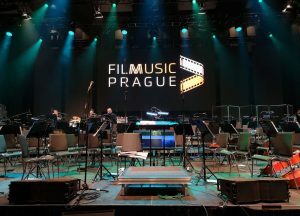 Film Music Prague is a veteran festival that is now in its 8th edition, and year after year it manages to raise the level of quality of its activities, as we will see throughout the article. Indicate that this year the festival had changed its usual dates, going from being held in the month of April, to be held in the month of February (read festival summary for 2018 and summary for 2017). In order to cover the entire festival, I went to Prague a day earlier, and so I had the opportunity to be present at the rehearsals that took place on Thursday 31/1 by the City of Prague Philharmonic Orchestra at Smecky Studios, supervised by Batu Sener, John Powell’s orchestrator. 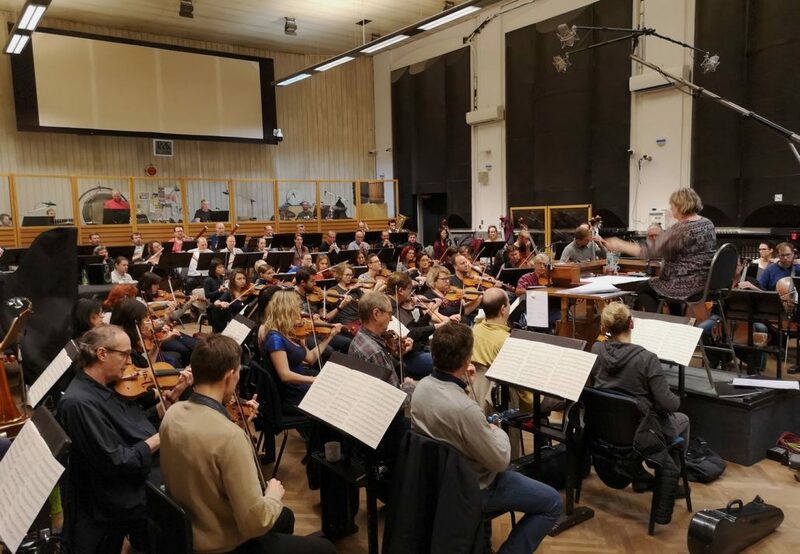 Rehearsals that as always, it is a joy to witness, as you can see how the orchestra is shaping and polishing the pieces, and the musicians gradually acquire mastery with each one of the takes. The great skills of the orchestra, together with the dedicated and precise conducting of Miriam Němcová, mold the pieces until they reach the version that is played at the concert. While the morning rehearsal session was very enjoyable, the afternoon session, in which the Kühn Choir joined, was even more interesting. The festival began officially today, a festival with free masterclasses and panels, which had increased considerably compared with the previous edition, and which were grouped in two days: Saturday 2nd and Sunday 3rd, during the weekend, in order for people to be easier to attend. 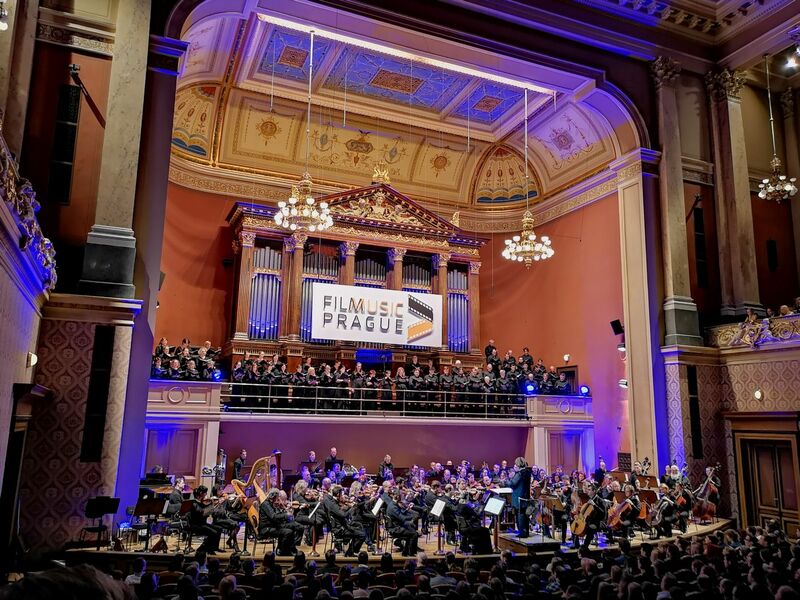 Therefore, during this first day, there would be no additional special events, except for the exhibitions present at the Festival Center (Kaiserštejnský Palace), and the important event of the day was going to be the night concert dedicated to the music of John Powell, which opened the festival at 19h at the Rudolfinum in Prague, entitled “Stars of Hollywood – John Powell”. 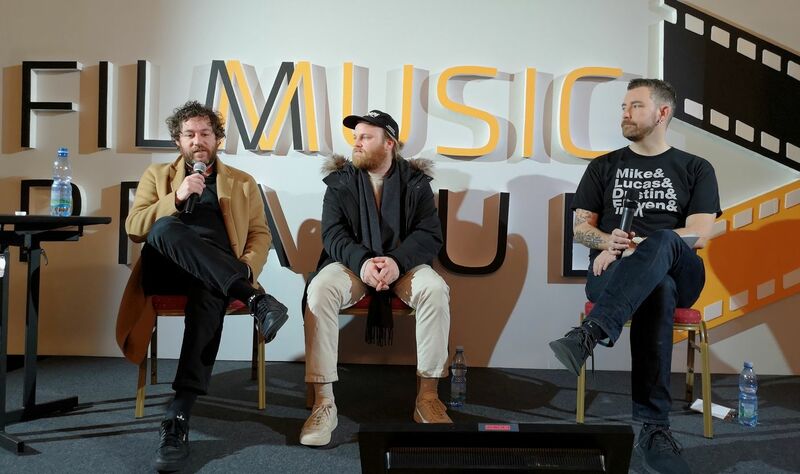 This concert, which had been initially planned for June 2018, had to be re-scheduled, being thus incorporated into the festival as the opening concert for 2019 (read news). 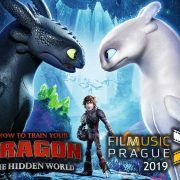 Just before the concert, at 18h, John Powell was going to be interviewed by British producer and presenter Tim Burden, but unluckily, John Powell couldn’t finally attend the festival, due to an unfortunate last minute family problem. As an apology, he sent a very touching letter, explaining the family and personal reasons that prevented him flying to Prague from London. 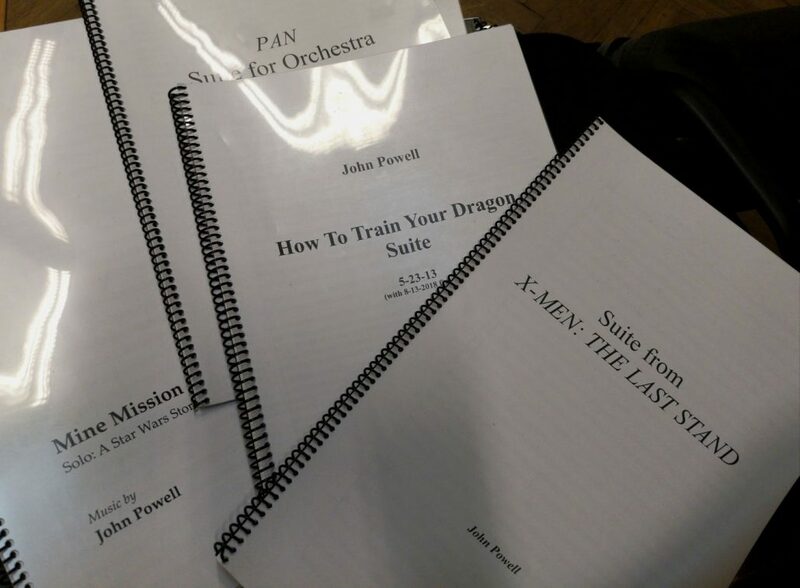 A real shame, since there were many people who, with the intention of seeing John Powell in concert, had reserved the initial date in June 2018, and then had made changes in their plans to attend this concert in 2019, and finally were not going to see the composer. 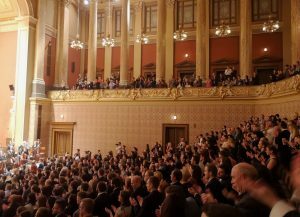 It is clear that the important thing in a concert is the music and the orchestra that plays it, but that does not mean that the composer, who is its creator, is not also an important piece, and a motivation for the people who come to see a concert. 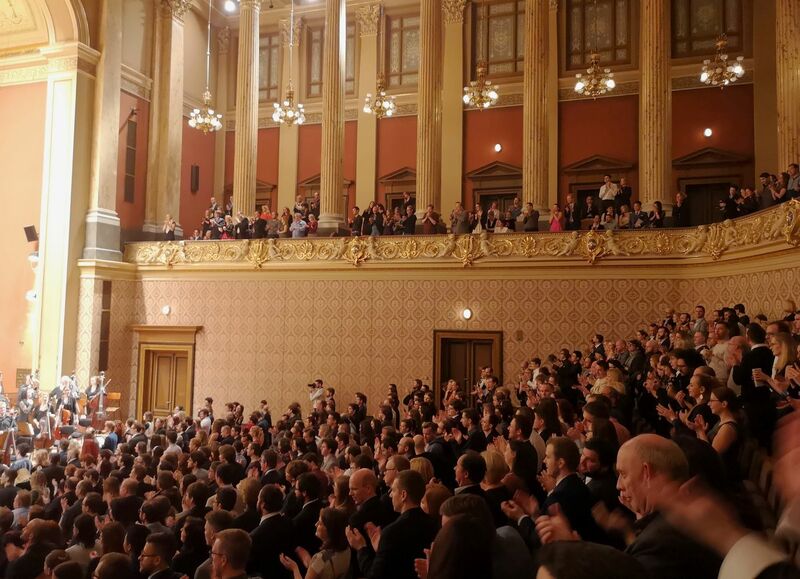 Due to the inclusion of the music of Star Wars in the concert, there were many fans of the galactic saga dressed as movie characters in the corridors of the Rudolfinum, something that created funny and endearing moments when people asked for photos. At 19:05h, the concert started with the presentation of the organizers and launching officially the festival, which was followed by the fanfare created by the composer, Matthijs Kieboom. Next came John Powell’s first piece, the music of How to Train Your Dragon – Suite, the first of the 4 pieces of the trilogy that we were going to listen to at tonight’s concert, one of them being from the third movie in a world premiere, days before its soundtrack was even released. 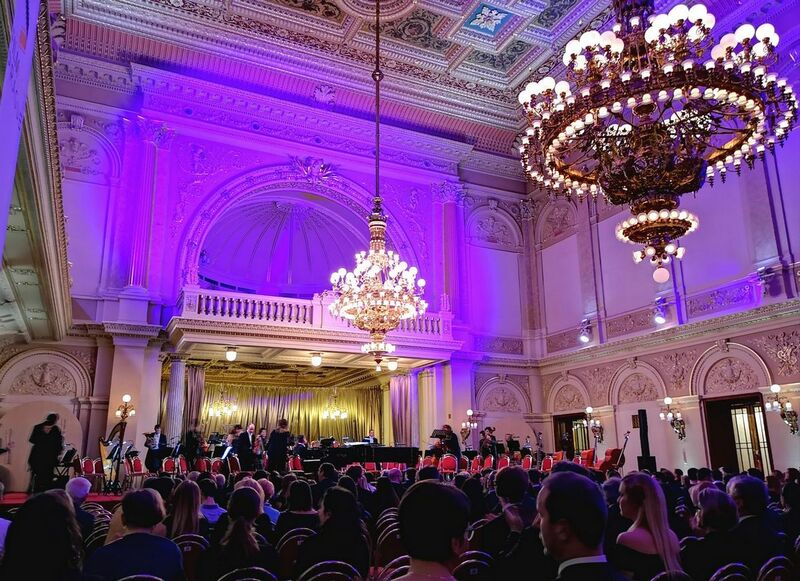 A delicious music, with a very good performance by the orchestra and the choir. 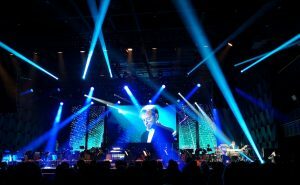 Note that this concert did not include any type of projection of videos or images, focusing all the attention of the public on the music, and it was not amplified due to the good acoustic characteristics of the place. 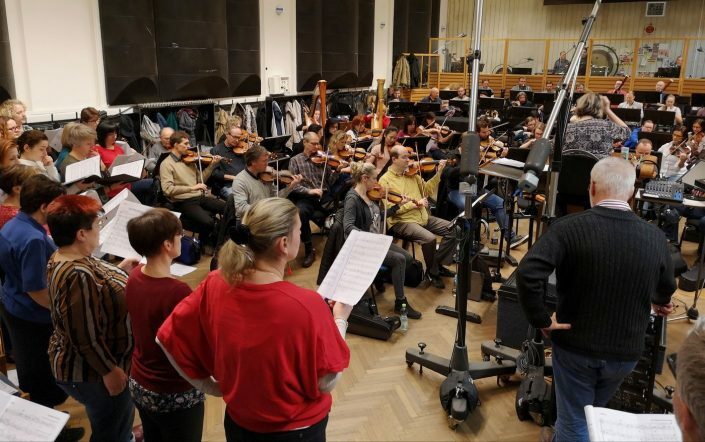 Following we had the piece Ice Age 2: The Meltdown – Suite, cheerful, dynamic and fun, with some amusing parts, as it fits to the music for an animated film, in which there was no participation of the choir. 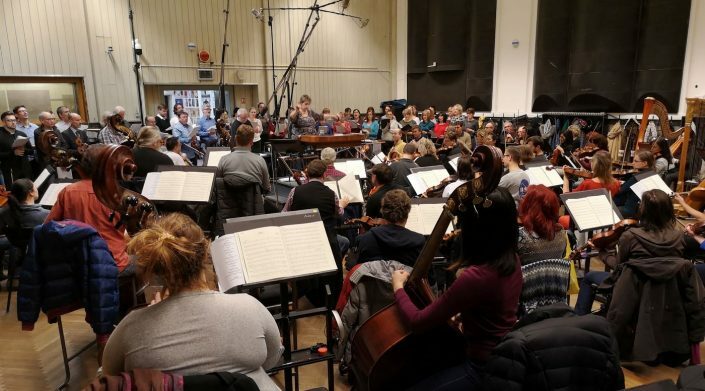 Then we listened to X-Men: The Last Stand – Suite, an epic piece, as a superhero-movie needs, with the participation of the female voices of the choir at the beginning, to later offer a melodic and melancholic part, in which you could glimpse a certain John Barry style. The conclusion of the suite offered action and adventure, with a musical resolution of the conflict. A slightly weak piece of The Bourne Identity – The Opening, gave way to a delicious Pan – Suite, very sweet and melodious, with intensity, and with a central part that included a great piano solo. 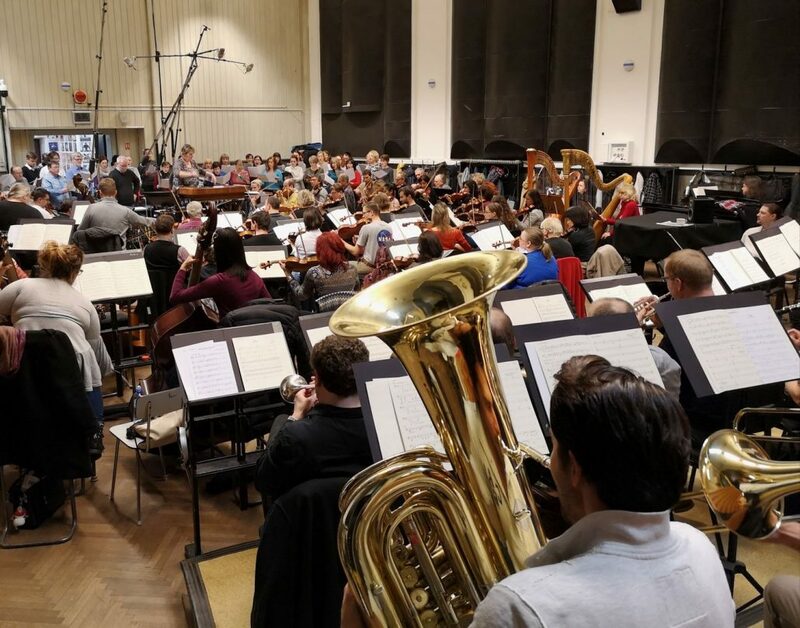 In this piece it was possible to observe the great work that the brass section of the orchestra was doing so far, which despite the effort that the intense compositions of John Powell were requiring, responded very well. 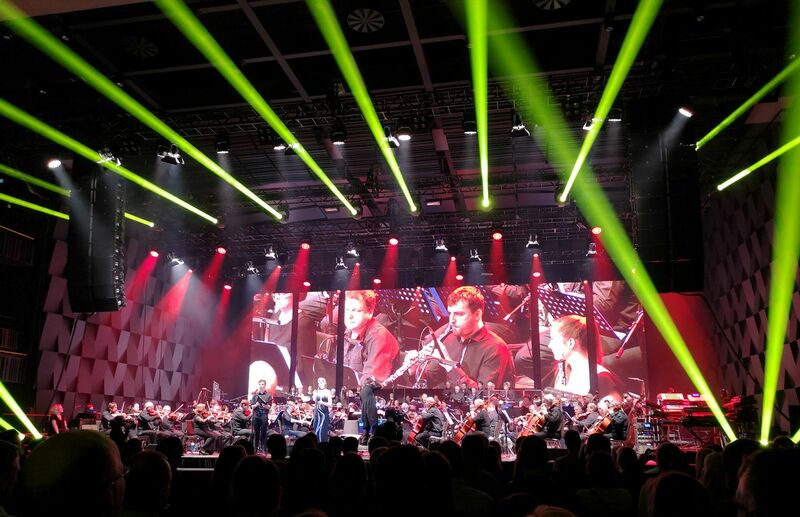 And to finish the first half of the concert, came the soundtrack of Solo: A Star Wars Story – Mine Mission suite, a martial and imperial piece at the beginning, with some very remarkable trumpet solos, and where again the brass section was showing off, delivering all the strength and intensity required. 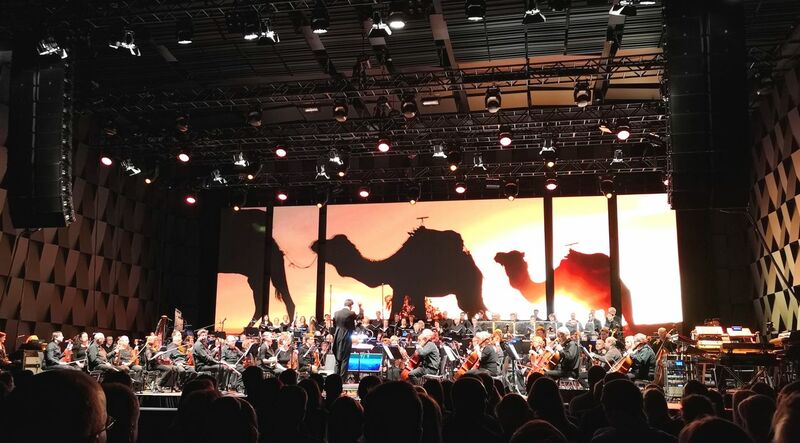 When it was 19:50h we arrived to the intermission, and started the second half at 20:10h with the music of ‘How to train your dragon’, specifically with the second movie, How to Train Your Dragon 2 – Suite. 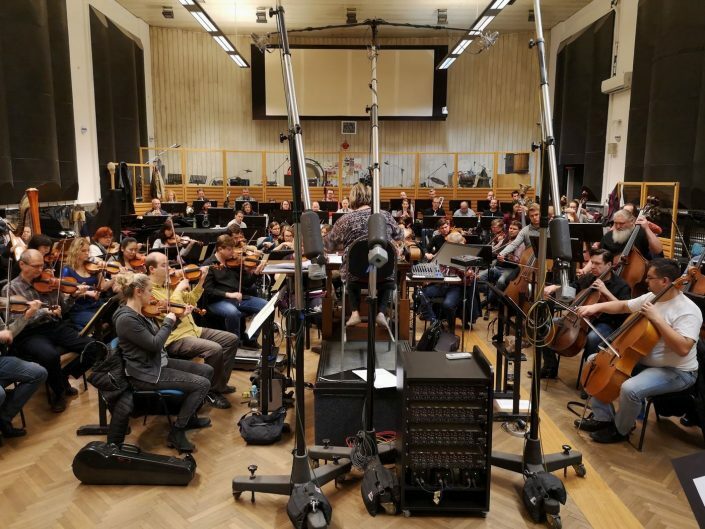 A powerful music that begins with the melody of two harps, to then give way to the full orchestra and develop for almost 10 minutes a variety of themes of the film. Exceptional! A brief and tender suite of Two Weeks Notice – Love Theme gave way to Ferdinand – Suite, jocular, cheerful and fun, where a Spanish guitar was a big protagonist, in a piece that had influences from the “Pasodoble” and Ravel’s Bolero in its development, mixing it with the orchestral elements. 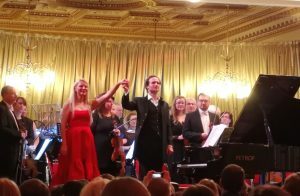 The piece Mr & Mrs. Smith – Tango de los Asesinos offered what its name promised, a tango where the accordion shone, helped by a Spanish guitar and the castanets, with a great solo of the concertmaster Lucie Svelhova. 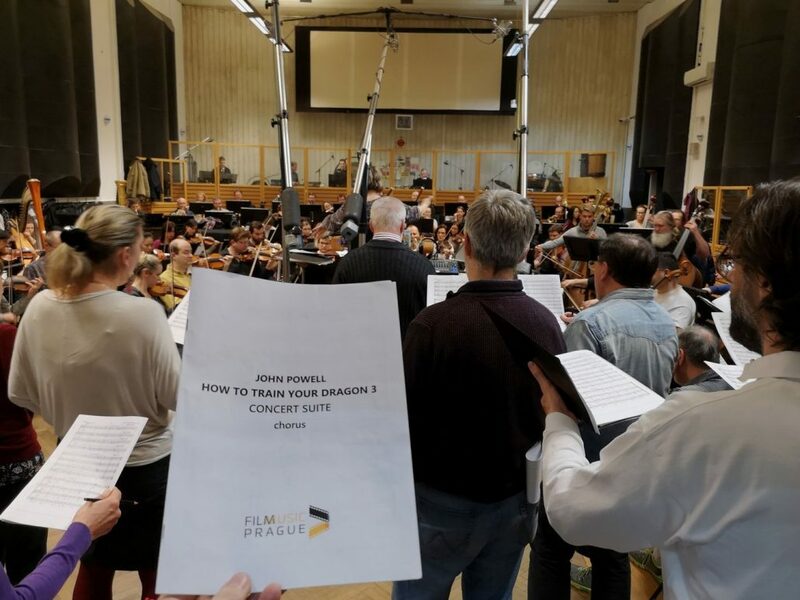 Once more we went back to the music of ‘How to train your dragon’, to a delicious and very delicate theme, which is one of the central themes of the first movie: How to Train Your Dragon – Forbidden Friendship. 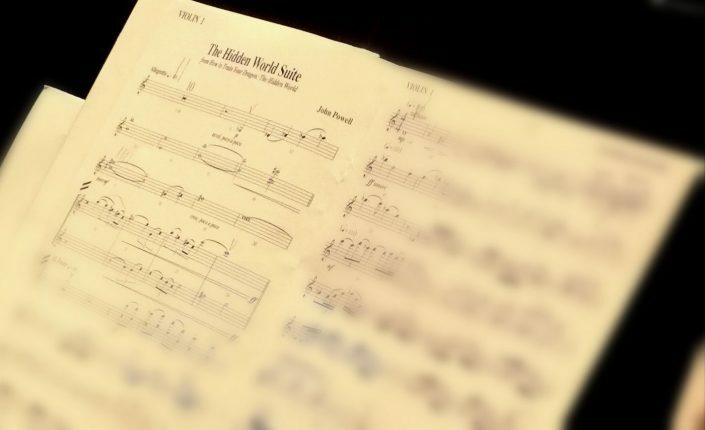 A wonderful music, which was not completely correctly performed, having sometimes a forced rhythm and sometimes a slow rhythm, which did not correspond to the original piece. And when it was almost 21h, we had the world premiere of the How to Train Your Dragon: Hidden World – Suite, from the third and final installment. 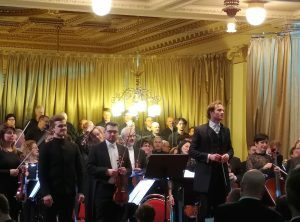 A great 8-minute suite where both a successful orchestra and a very dedicated choir, gave us an excellent performance. 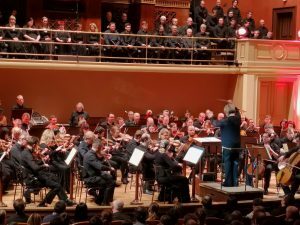 The audience showed with their applause that they did not want to let the evening end like this, and the orchestra and choir went for the first and only encore: Chicken Run – Building the Crate. 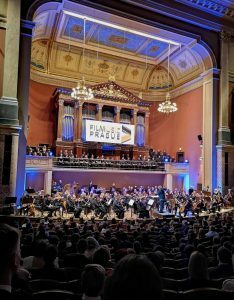 A very funny piece, which has a continuous dialogue between the orchestra and the choir, and many times it is done through the Kazoo, increasing even more the funny sensation of the piece. 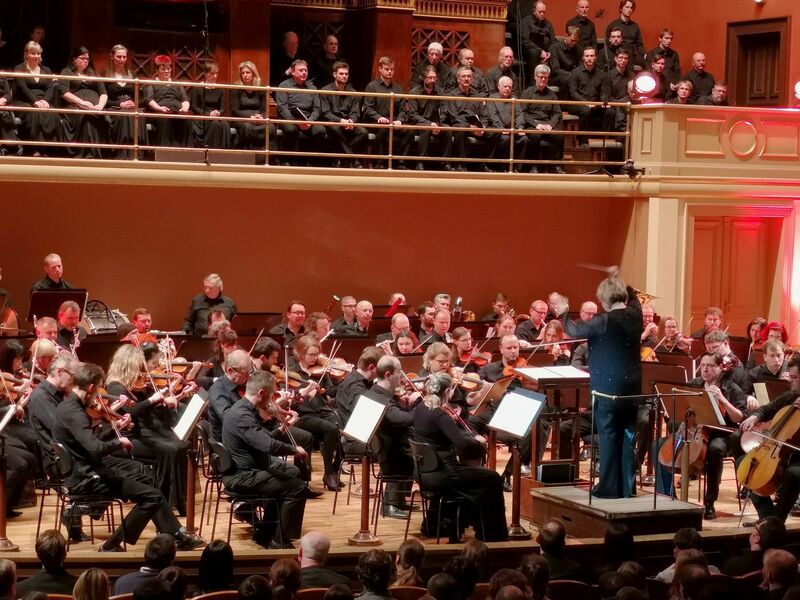 But, the orchestra was too fast in its performance, and their powerful sound was over the choir most of the times, leaving the mix completely out of balance, meaning we were not able to observe the nuances of suite. An unfortunate performance, for a piece that should have been the big finale of the concert. 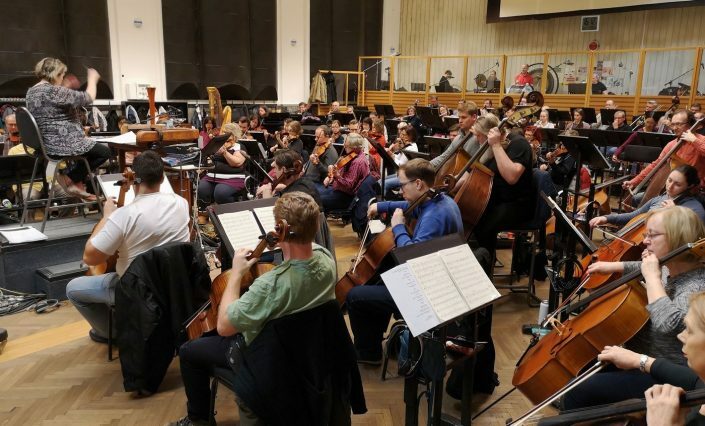 In summary, you could say that there were some pieces where the orchestra was not very sharp, including the encore, but nevertheless, there were other pieces in which they stood out such as in X-Men: The Last Stand, Pan, Solo or most of the music of How To Train Your Dragon. The concert was quite good and enjoyable, but you cannot talk about a perfect concert, since the performance was not as polished as it should. 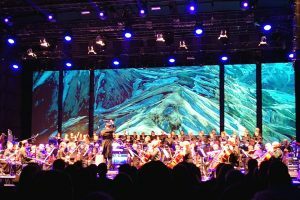 And so, the great music of John Powell, with a fantastic program, was the true protagonist of the night, despite of his absence. 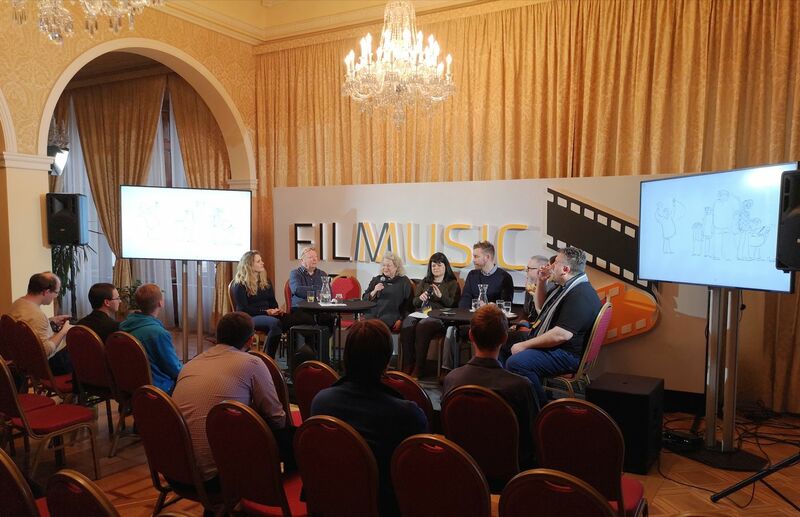 We started the second day of the festival with the free panels/masterclasses that would take place at the Festival Center (Kaiserštejnský Palace). 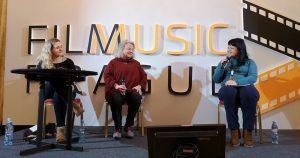 The first conference was 12:30h – The Sound of Stranger Things: Kyle Dixon & Michael Stein, were we could know better the composer duo behind the synth soundtrack for popular Netflix series Stranger Things, who told us many details about their music for the series and about their future work, under the moderation of Chandler Poling. 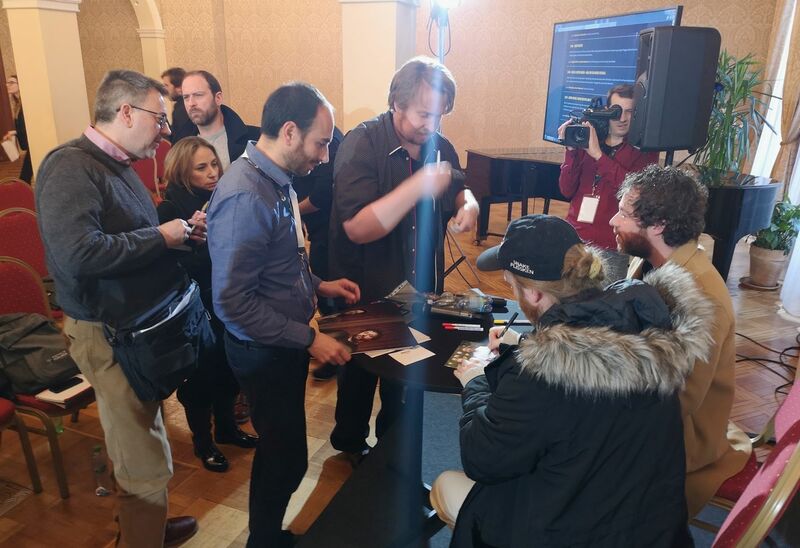 As usual, at the end of the talk, there was a signing session and the possibility of a photo with the composers by the attendees. Following at 14:00h – Agent Wanted! 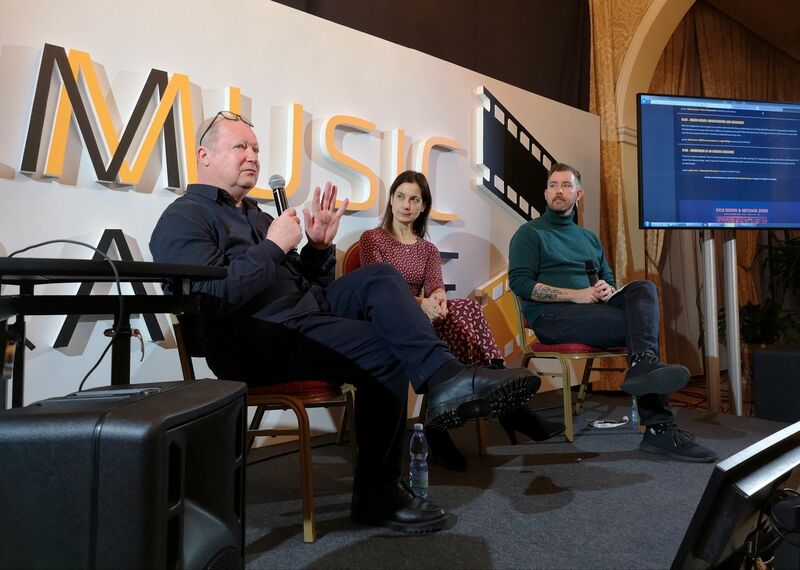 with Maggie Rodford & Chantelle Woodnutt from Air-Edel, moderated by Eleni Mitsiaki, where they talked about the role of agents in the film music industry and why is always important for a composer to have a good agent. 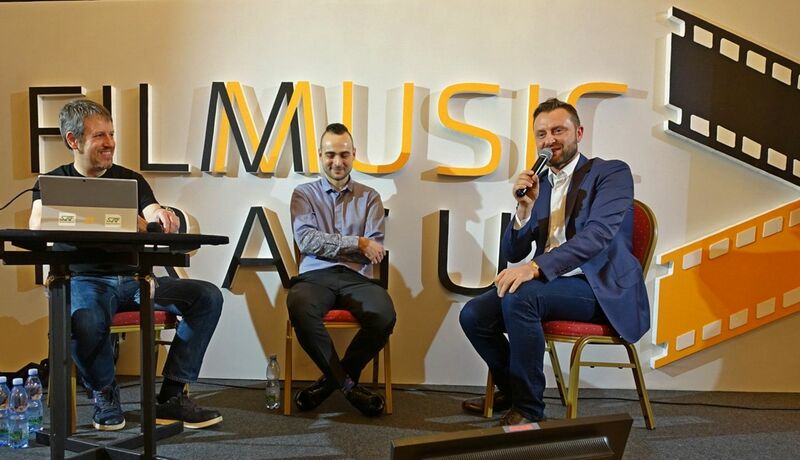 At 15:00h a special conference took place, where in the framework of the collaboration of SoundTrackFest with Film Music Prague festival, Gorka Oteiza (founder and director of SoundTrackFest) was going to moderate a conference entitled ‘Create a world better – A goal for film music festivals’ with Nikola Bojčev (director of Film Music Prague) and Robert Piaskowski (director of the Krakow Film Music Festival), to talk about live music events and film music festivals that encompass them. While it may initially seem that this kind of conference would not give much to talk about, in its presentation we focused on the educational and cultural aspects that a festival offers to a city, which help in their development, growth and improvement of the quality of life, making comments about multiple subjects both by Robert Piaskowski and Nicola Bojčev, who gave a different point of view to the attendees, and that many people at the end of the talk, came to comment and thank. At 16:00h – Hidden Heroes: Orchestrators And Arrangers with Nikiforos Chrysoloras and Leigh Phillips moderated by Eleni Mitsiaki, where they talked about the work of the orchestrators and arrangers, the people who are behind many popular soundtracks, telling us about their challenges, inspirations, or how it is to work with the music of a legend like Jerry Goldsmith. And to end the intense day of conferences, at 17:00h we had The Soundtrack as an Artistic Challenge, with John Lunn and Alexandra Harwood, moderated by Chandler Poling, where both composers talked about how they face the challenge of creating a soundtrack with the examples of several of their works (John Lunn with Downton Abbey and Alexandra Harwood with The Guernsey Literary and Potato Peel Pie Society). 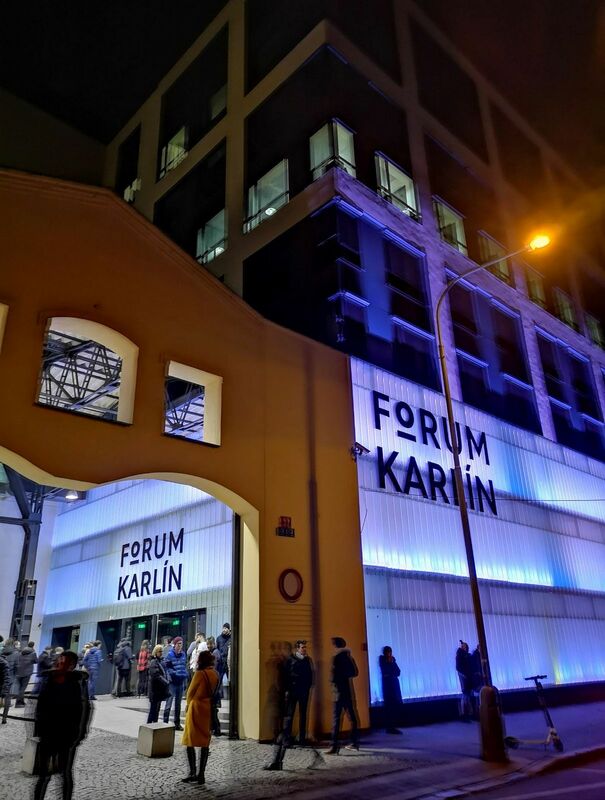 And almost without noticing, it was time for the two concerts of that night at the Forum Karlin. The first concert began at 20h, and was a celebration of the music of the TV series STRANGER THINGS from Netflix, played by composers and musicians Kyle Dixon and Michael Stein (from the band S U R V I V E). 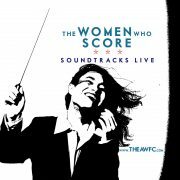 A soundtrack that has become one of the greatest cultural phenomena of recent years. With the audience already in their seats, at 20:10h the lights went out, and some flashlights at the end of the stage projected mysterious halos of light between cranes and cables, showing the figure/silhouette of 2 people in the center of the Stage. It was the musicians Dixon and Stein, who commanded several synthesizers, offering different themes and environmental sounds that made up the music of Stranger Things, accompanied by an audiovisual show and smoke, including LED lamps that changed colors, and even made movement effects, at the same time that the music was having different intensity patterns. A technically interesting concert, with an excessively loud sound for my taste, and that probably pleased the diehard fans of Stranger Things, but that did not generate any special feeling in the rest. 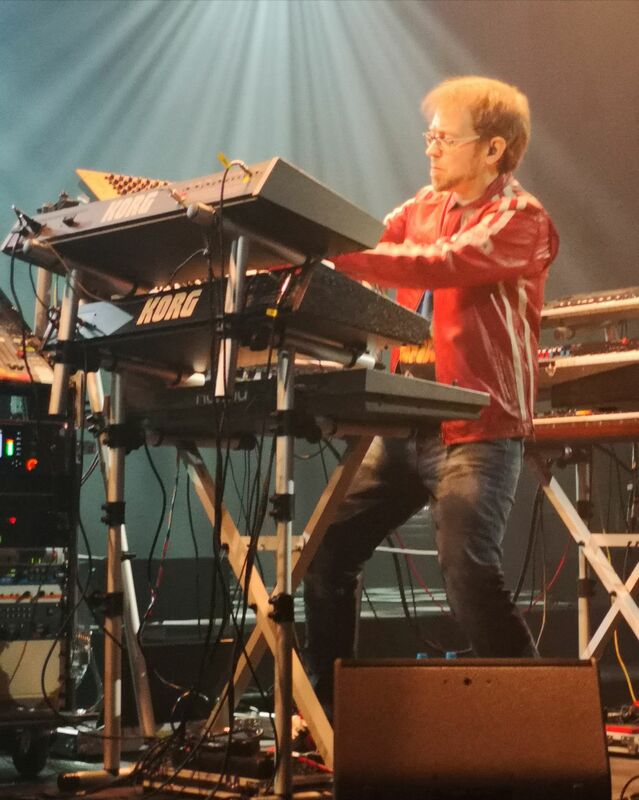 Then, at 21:25h, the stage was prepared for the following concert entitled Kebu – The Master of Synthesizers. 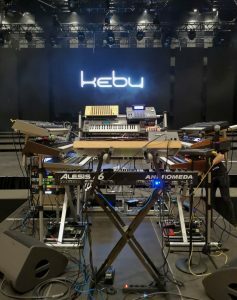 It had a set of synthesizers that formed a rectangular cubicle in various heights, where as if it were a boxing ring, the musician Kebu was going to be placed “to fight” with them. An array of analog synthesizers that offered great sounds for more than 2 hours, with melodies from the eighties that hooked the audience, and some of his themes interspersed with film music pieces, which made this concert become the true star of the night. 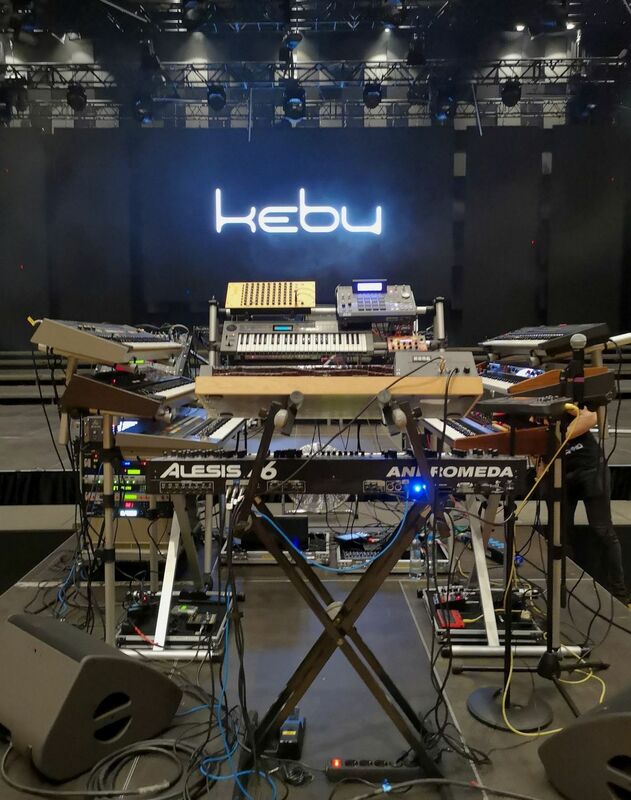 Indicate that after the concert of the music of Stranger Things, the venue started to empty, and this caused people to get closer to the front rows to see Kebu in person, crowding and surrounding his array of synthesizers. This was something that the artist received with great pleasure and the audience also celebrated, since they felt that the concert was more personal, directly for them. As a weak point to this fabulous concert, it could be noted that there were few pieces of film music in the repertoire and many of his own themes, in a somewhat unbalanced program. 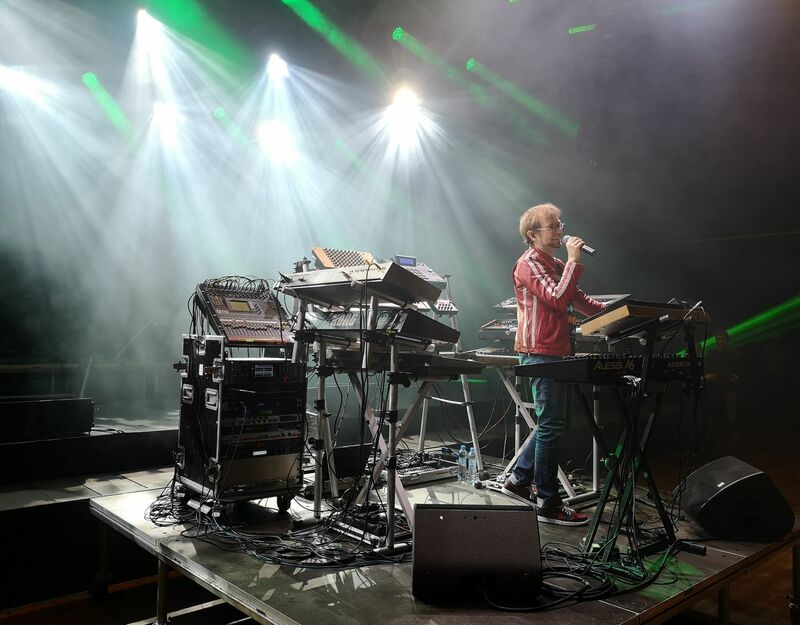 I have to highlight the theme that skillfully mixed the music of Star Wars with the theme of Stranger Things in the synthesizers, since it was a piece that pleasantly surprised the public. A great concert that lasted until midnight, almost having to vacate the premises because the scheduled closing time was nearly over. 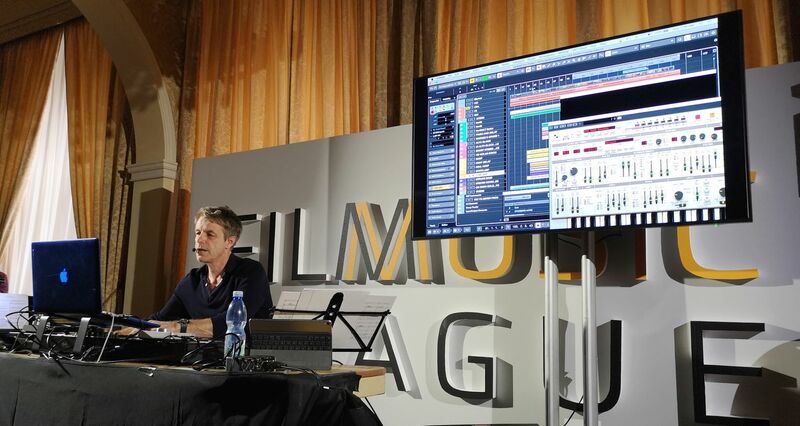 Once again the day was going to start with several master classes, being the first of them one of the most anticipated of the festival, the one offered at 11:00h by Harry Gregson-Williams. 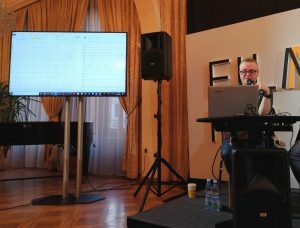 This famous composer, who has created the soundtrack of many successful films such as The Kingdom of Heaven, The Martian, the Narnia saga or Shrek, presented us in a very didactic way his composition process, his inspirations, and his ideas. For example, using the main theme of Shrek, he showed us with his computer and his tools, how he was adding or removing layers and thus giving a different tone to the music, to fit with the images that he presented to us. 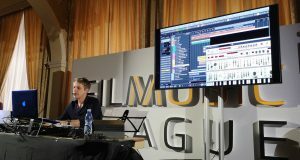 Another very interesting example that he offered was from the film Man On Fire, where in an key action sequence, he demonstrated how he was adding different musical layers to give the tension that the montage required. Unfortunately, this version was not used in the movie, as it often happens. However, in the movie Unstoppable, Harry did show us the final scene, which he had created by adding multiple instruments, electronics and effects, and which was used in the film. Probably the best example of all those things that he explained during his 1-hour master class was the one related to the movie The Martian by Ridley Scott, where he told us how a simple musical motif of 2 notes for the protagonist, was what gave him the basis to create more during many of the scenes of the film, showing us the different moments of the main character, applied to his loneliness, his courage, and the overcoming. 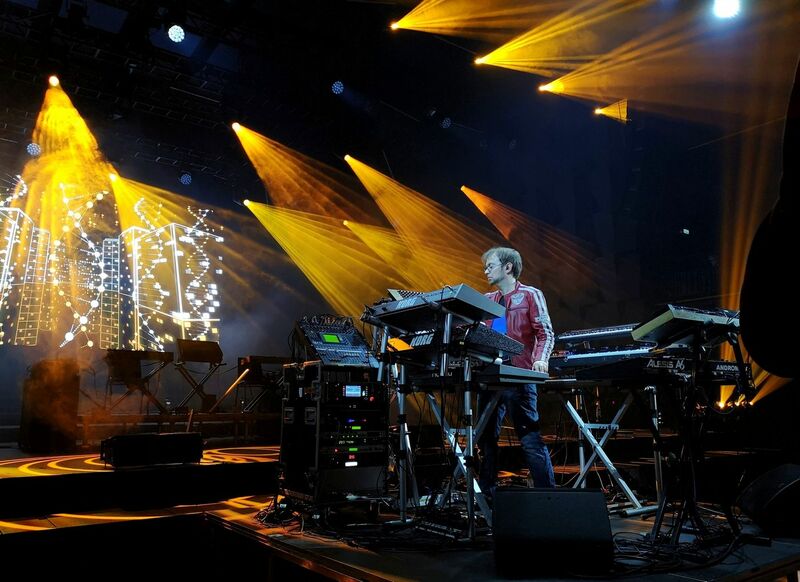 Special mention for the scene in which Matt Damon has to cross a long distance in Mars with his little Rover vehicle, and how initially Harry made a Pink Floyd-style rock version of the music (which jokingly he called ‘Dark Side of Mars’), which was completely rejected by Ridley Scott, who asked for a more traditional orchestral version based on strings, synthesizers and horns, which was what eventually ended up in the movie, and the truth is that it was a perfect fit. Now, to be able to listen and see that creative jewel for that particular scene of the film, which is nowhere else but in the personal files of Harry Gregson-Williams, was a real privilege. Once the CD signing and photo session with Harry Gregson-Williams was over, next conference came at 13:00h – The Magical World of the Music Editor with Mark Willsher, which had to be cancelled, since due to the great snow that had fallen the previous night, many roads and even the airport were collapsed and Mark could not arrive in time to the conference from London. At 14:00h the last conference of the festival was held, a massive conference entitled Teamwork, which featured John Lunn (composer), Alexandra Harwood (composer), Mark Willsher (music editor), Maggie Rodford (agent), Chantelle Woodnutt (musical supervisor) and Chandler Poling (PR manager), moderated by Eleni Mitsiaki, where team cooperation was discussed and where the guests offered different points of view, from different professions in the cinematographic field: from composers and their agents , to music publishers and orchestrators, public relations, and so on. 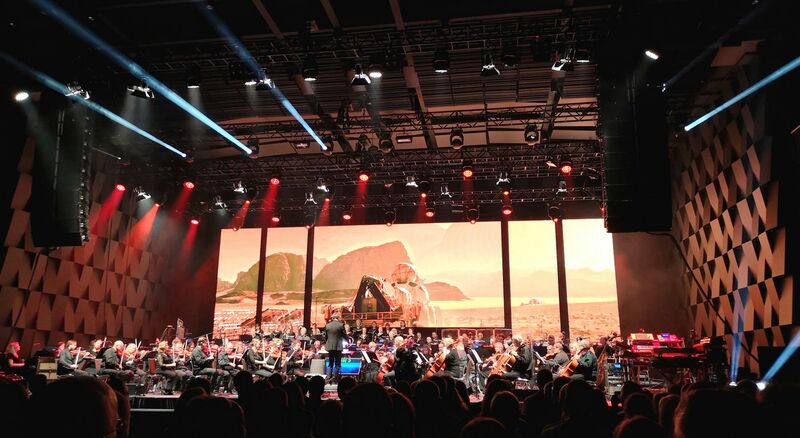 At night, and again taking place at the Forum Karlin, the concert Legends: Ridley Scott was held, focused on the music composed by Harry Gregson-Williams for the films of the legendary director Ridley Scott such as The Kingdom of Heaven, The Martian, Prometheus and Exodus: Gods and Kings, in a program that also included music from other famous Scott’s films like 1492: The Conquest of Paradise, Hannibal or Gladiator. 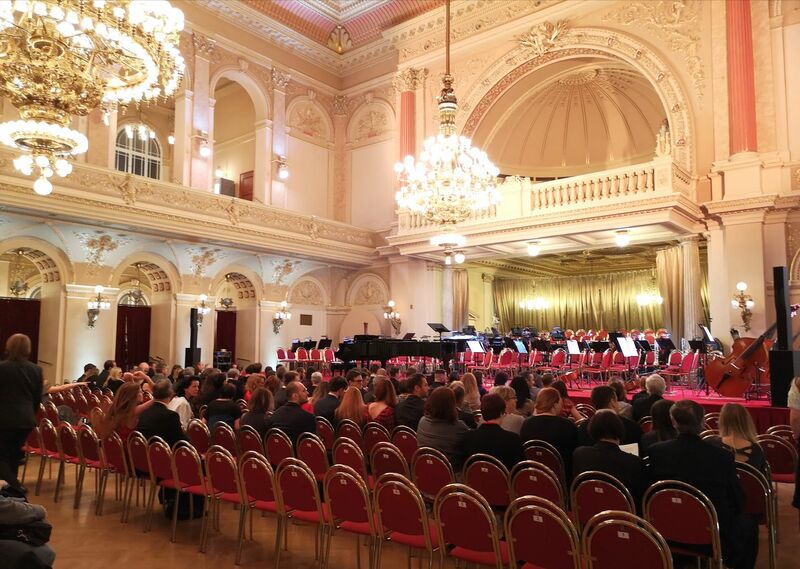 After the orchestra, choir, and conductor entered the venue, the concert started at 19:10h with the fanfare of the festival, which has already become the symbol of its identity. 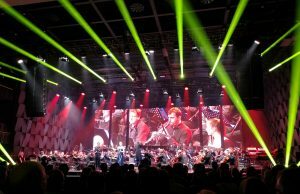 From the beginning we could see how huge LED screens were set behind the orchestra and choir, where the images related to the music that was performed were shown, mixed with the live performance of the musicians and soloists. 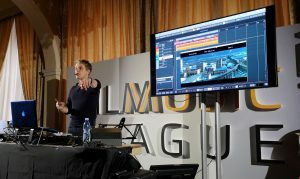 Five screens in total: a large rectangular screen in the center and two smaller vertical screens on each side, giving the option to show different images and different visual motifs separately. 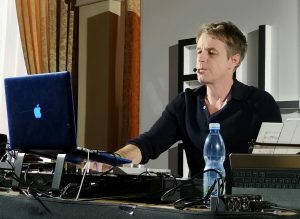 As the concert used images/videos from movies, the orchestra was going to make use of the ‘click-track’ through headphones for the musicians, in order to receive the pulse and the exact rhythm of each one of the pieces, and thus synchronize the performance as closely as possible to the images and videos. 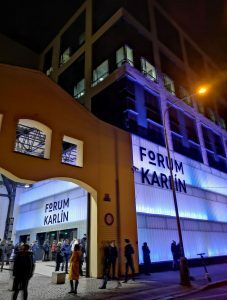 Also, since some pre-recorded sounds were used in the concert, and since the acoustics of the Forum Karlin are not the ideal ones of a concert hall either, the whole concert was going to be equalized and amplified. 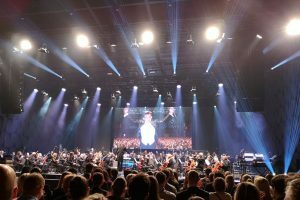 The first piece that was played was Conquest of Paradise – Theme – Vangelis, very well performed, while on the screens images of boats and ships with live shots of the orchestra playing where shown. 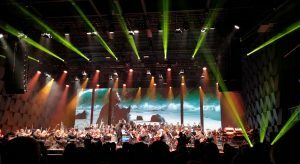 Next came Prometheus – Suite – Harry Gregson-Williams with images of the film’s introduction and an orchestra and choir that had a very faithful interpretation of the original piece. 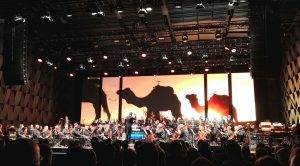 Then we listened to Kingdom of Heaven – Suite (Caravan Raid / Swordplay / Coronation / Everything – chorale) – Harry Gregson-Williams, with a somewhat irregular but adequate performance. 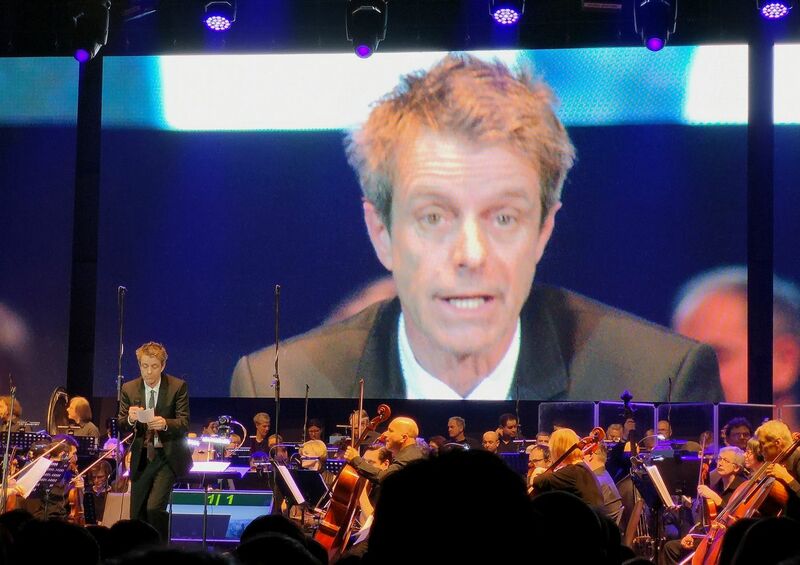 The next piece, The Martian – Suite – Harry Gregson-Williams, was divided into two parts and had a shared conducting by Chuhei Iwasaki and Harry Gregson-Williams, who took the stage to say a few words (part of them in Czech) and conduct the second part of the piece, which included mixes of pre-recorded synthesizer sounds. Very good suite. The first part of the concert ended with Exodus: Gods and Kings – Suite – Harry Gregson-Williams, a world premiere with arrangements made by Mark Graham. A piece of almost 15 minutes, which briefly tells the story of the film, offering tension, battle, action, and epic struggles, with a central part dedicated to melancholy and love, then giving way to the tension of the Exodus, with a battle in the Dead Sea ending with an epic choir, while the great wave that closes the story arrives. And so at 20h we got to the intermission, to continue half an hour later with a fabulous and mythical theme: Blade Runner – Suite – Vangelis, which had a great performance by Kebu (Sebastian Teir), who was placed alone on one side of the stage, and received all the attention of the lights, while doing his performance with the analog synthesizers, being superbly accompanied by the visual effects offered on the screens. A great theme and a great performance and visual design. 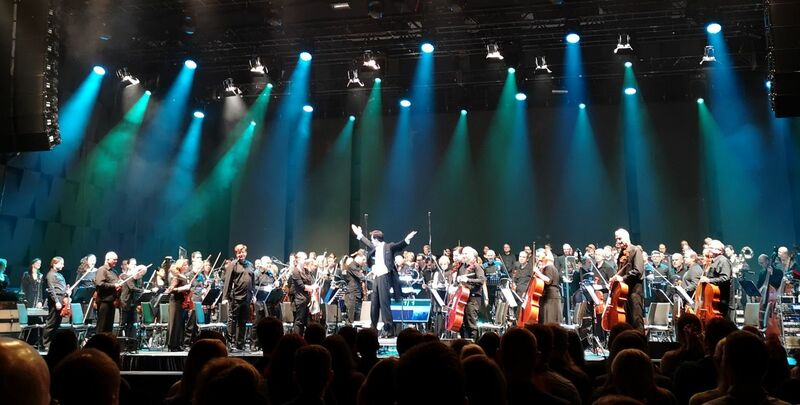 After a great applause, Kebu left the stage and gave way to the musicians and the choir, to perform Legend – Suite – Jerry Goldsmith, a world premiere specially prepared for the festival by Leigh Phillips. 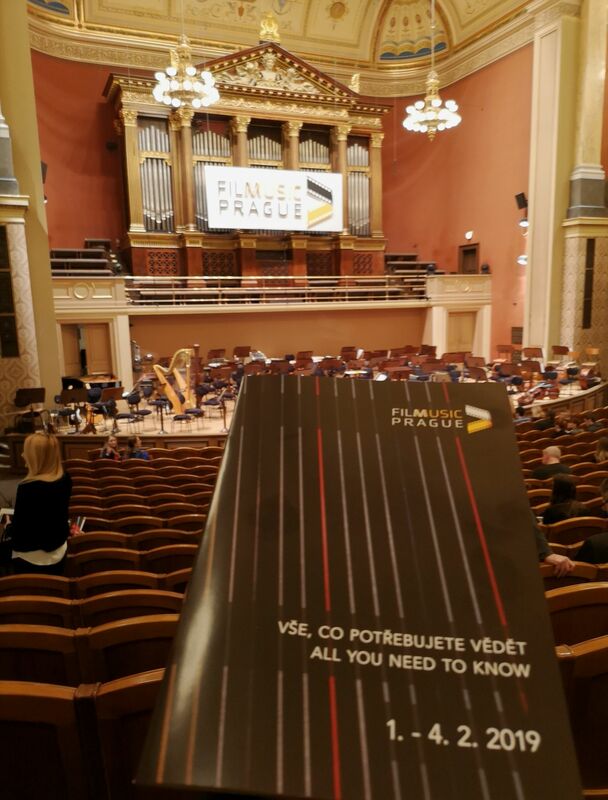 Very good suite with a great work of the orchestra and choir! When it was 21h, The Duellists – Suite – Howard Blake was played, a very interesting suite, which was followed by Hannibal – Vide cor meum – Patrick Cassidy with the great performance of the two soloists, the soprano Karolína Žmolíková and the tenor Ondřej Benek. 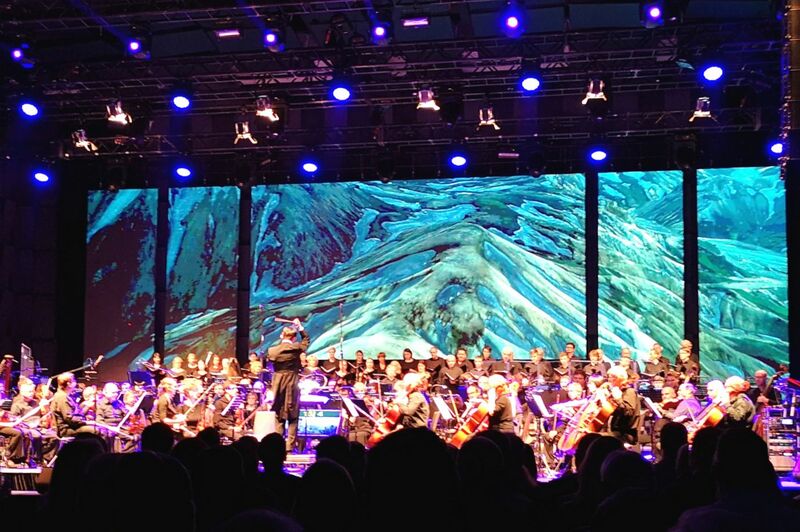 Arriving at the end of the concert, we were able to enjoy the world premiere of Alien – Suite – Jerry Goldsmith, a suite specially prepared for the festival by Nikiforos Chrysoloras, which lasted almost 15 minutes, and transported us beautifully to the sonic world of Alien created by maestro Goldsmith. 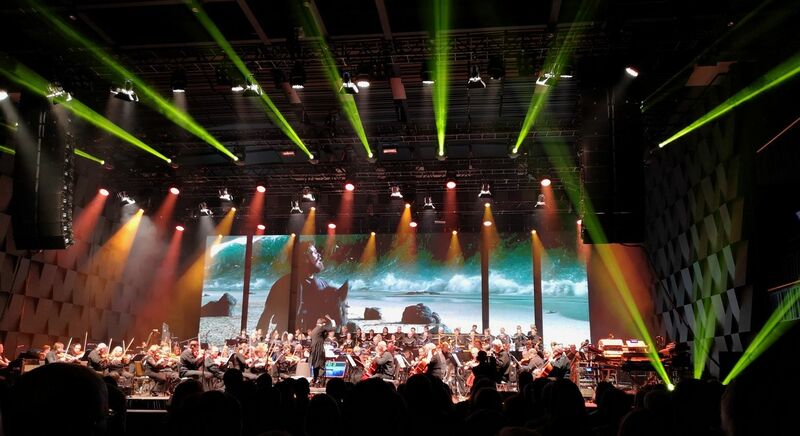 And finally the encore arrived, Gladiator – Suite – Hans Zimmer and Lisa Gerrard, where a committed orchestra and a powerful choir, offered a very intense suite of more than 10 minutes that contained a nice set of all the main themes of the soundtrack. A great ending to a very good concert. 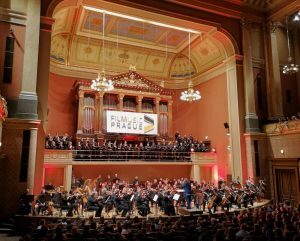 While most of the people who had come to the festival for the weekend, could not stay on Monday, Film Music Prague had scheduled a special concert for this day at 19h at the Zofin Palace. The closing concert of the festival was a charity concert in favor of Unicef Czech Republic with concert works by famous Hollywood composers, such as John Powell‘s oratorio A Prussian Requiem, in commemoration of the First World War, or the European premiere of Howard Shore’s piano concert Ruin & Memory, and the Song For The World Peace composed by the legendary John Williams. 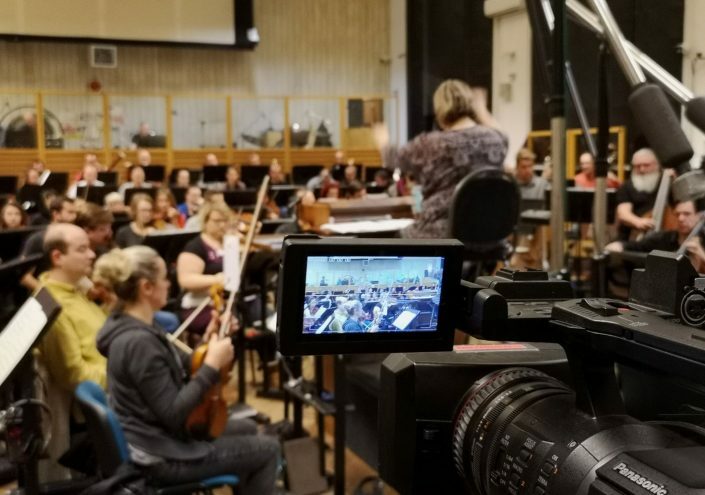 A different point of view of those composers that we know so well, and whose works for the cinema we have listened to so many times. 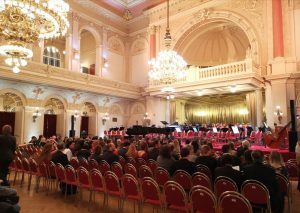 Unfortunately, this “slightly alternative” concert (compared with the rest of the concerts offered at film music festivals), resulted in the Zofin Palace not being filled, having approximately 60% occupancy of the hall, since it seems that it didn’t massively attract people from both worlds: neither fans of film music, nor followers of classical music. 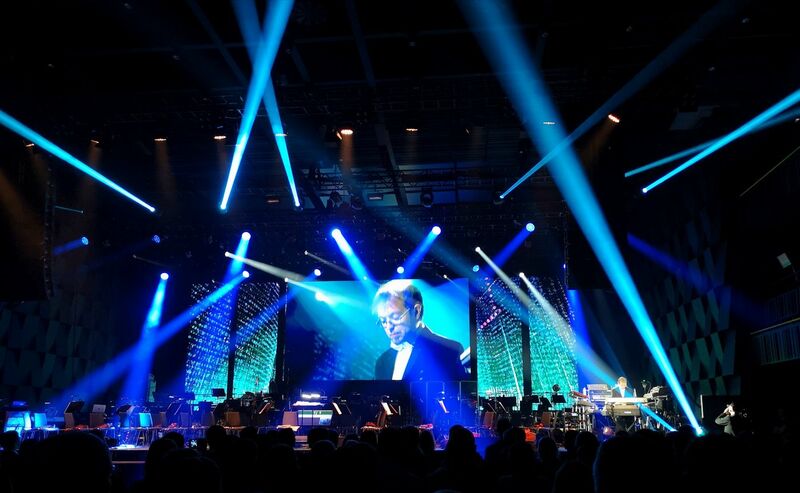 The concert started at 19:10h with the work Song for World Peace – John Williams, where one could sense the style of the maestro in the music of this delightful piece of almost 10 minutes. 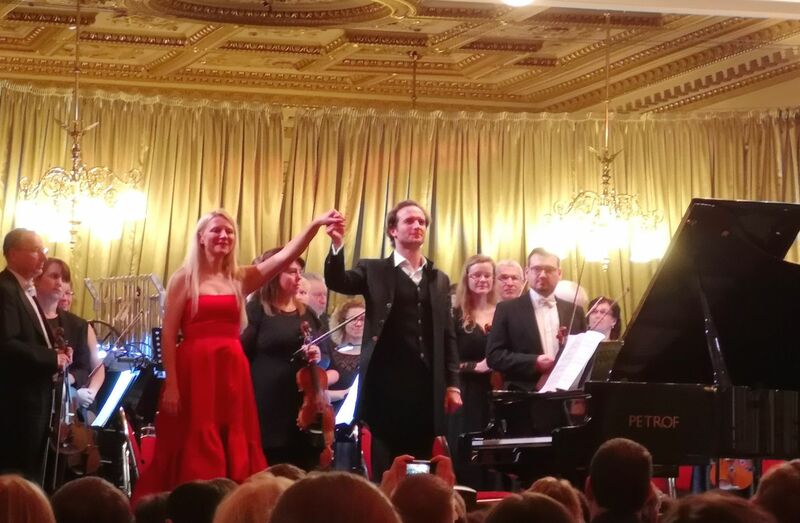 Then came the turn of the European premiere of the work Ruin & Memory – Howard Shore that would have the mastery of the pianist Valentina Lisitsa, and who needed the collaboration of Nikola Bojčev to turn the pages of the score. 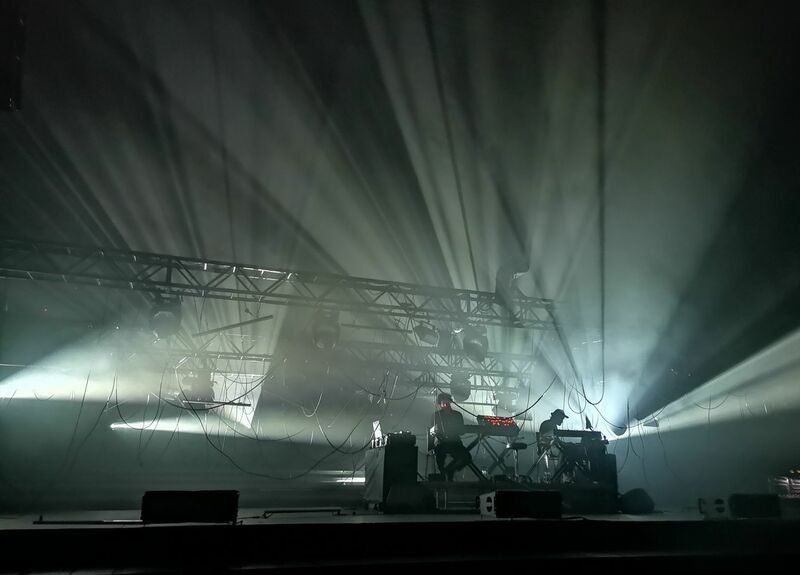 A piece divided into several movements, which had softer sections, more agile and intense sections, and which lasted about half an hour. At 19:50h arrived the intermission, returning to the concert at 20:20h, when the orchestra, the choir, the conductor Christian Schumann and the soloists Petr Nekoranec (tenor) and Boris Prýgl (baritone) appeared on stage, to perform the great concert work of John Powell, A Prussian Requiem. A 45-minute oratorio with libretto by Michael Petry, which Powell composed between 2014 and 2016 to commemorate the centenary of the end of the First World War. 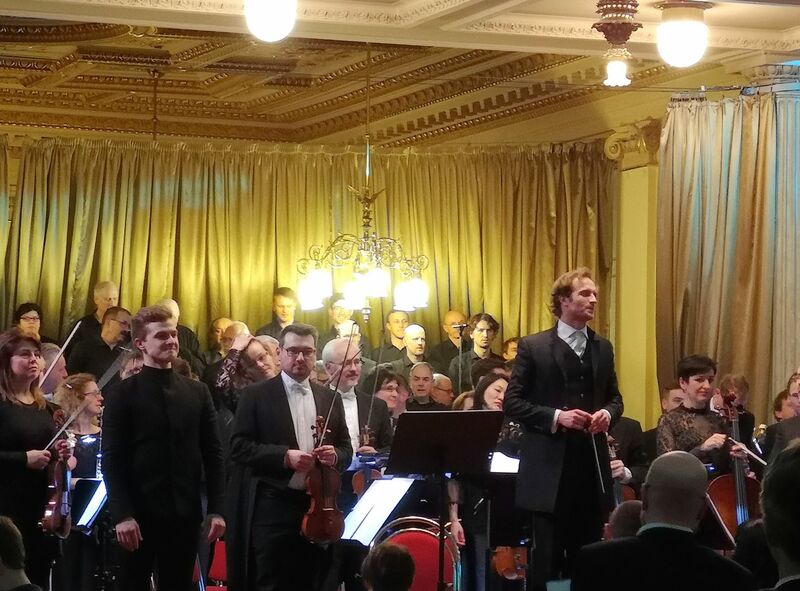 An intense work, where the choir has great strength and predominance, alternating with the performances of the two soloists, and which had a very good development. 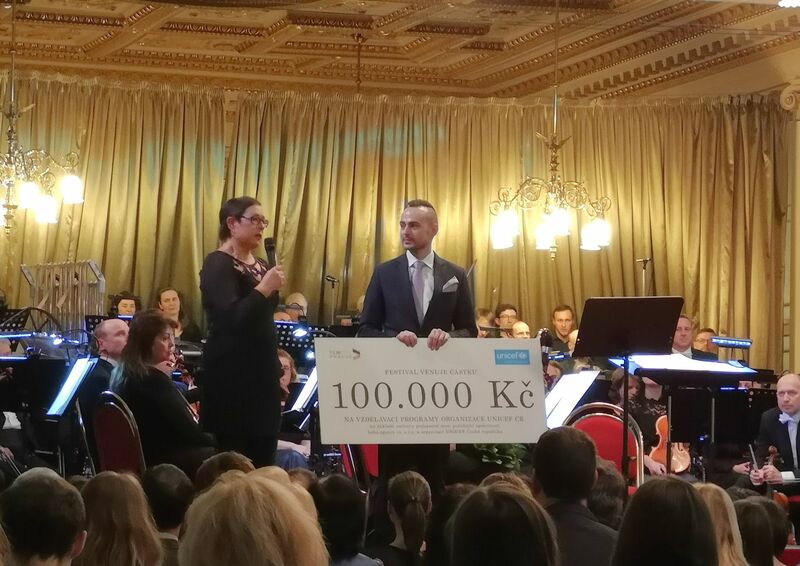 At the end of the concert, at 21h, festival director Nikola Bojčev handed out a check of 100,000 crowns (about 3880 €) to Unicef Czech Republic, thus closing the evening and the festival, thanking the public for their attendance and calling us to meet again in 2020. As usual, before moving on to the conclusions, let’s make a brief review of those strong points of the festival, and those points that should be improved for future editions. Absence of John Powell. Very few things can be improved in this year’s edition of the festival, since the organization has been impeccable, and the quality of the events offered both at the music level and with the master classes and conferences has been great. However, there is an element that has been a disappointment for fans and has been the absence of John Powell. It is clear that unforeseen circumstances cannot be controlled, especially if they are due to family or health reasons, as it has been the case. 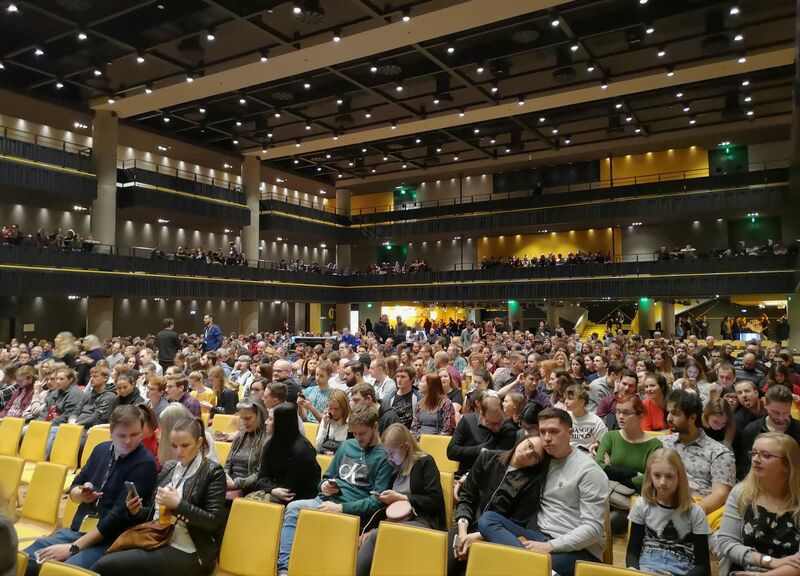 Many people showed up an hour before the concert to listen to the talk that was going to be on stage with John Powell, something that evidently did not happen. 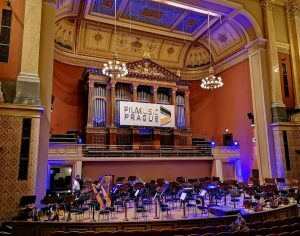 In the end, the important thing in the concert is the music, but there are many people who attended the concert because of the composer, and who would not have traveled to Prague if John Powell had not announced his presence in the concert. These people didn’t deserve to find by surprise that the composer was not going to attend the concert shortly before its beginning. Venues. 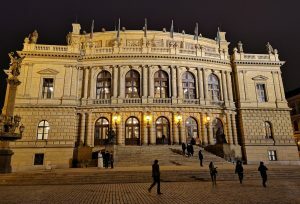 It should be noted that the diversity of places chosen by the festival to hold the concerts has been very appropriate, with the Rudolfinum for the opening concert, an elegant and solemn venue, the Forum Karlin for the “electronic concerts” and the great concert with music from the films of Ridley Scott, where a more casual and also more dynamic tone is acquired, and finally the Zofin Palace for the charity gala concert, a place according to the style and the theme of the event. 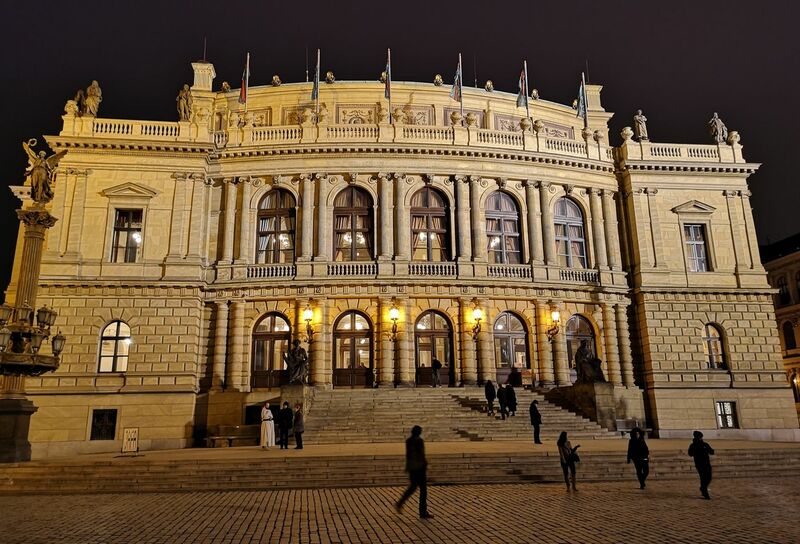 Very good choice of places, varied, and appropriate for the concerts that were held in them. 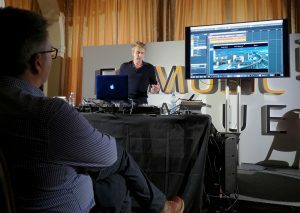 Masterclasses/conferences. 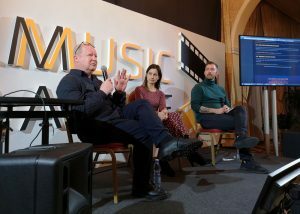 The number and diversity of masterclasses and panels offered this year has increased significantly compared with last year, as has also increased the number of guests related to film music industry in its different aspects: composers, orchestrators, agents, publicists, journalists, etc… giving way to varied, interesting, and diverse talks, which have brought many very productive points of view. 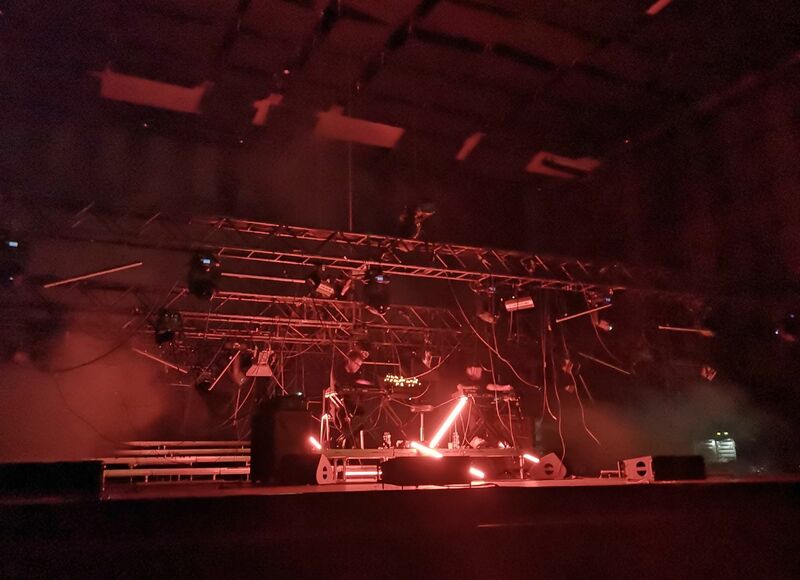 Concerts – Quantity and variety. This is one of the festival’s strong points, offering multiple concerts for all tastes and flavors. 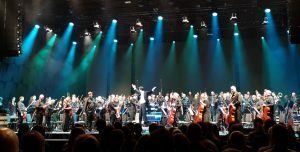 The entire program as a whole is a risky bet, because doing 2 symphonic concerts, 2 concerts of “electronic music”, one of them dedicated to the TV series Stranger Things in particular, and ending the festival with a charity concert with music by film composers that has nothing to do with this media, but with works created especially for concert halls, is at least audacious. Now, this variety makes that people who go to the festival to spend three or four days, can have different alternatives to choose from, according to their tastes and their priorities. 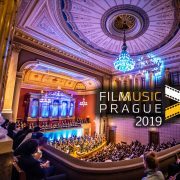 Film Music Prague has always been characterized for offering a program different to other festivals and events, an alternative program with a careful selection full of quality, and this year hasn’t been different, improving over last year, offering a fabulous program. Dates. 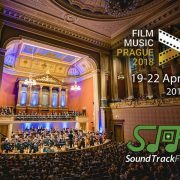 I think that changing the dates of the festival is a good thing since the month of February is relatively free from other similar events in the calendar, and gives the festival more space to develop, and fans of film music as well as the professional of the industry, have more possibilities to attend. Perhaps this change of dates has a small negative side, which is the harsh and cold weather that Prague offers in February, but that can also be looked from a bright side, since seeing snow during the festival and being able to view a white landscape while enjoying a great film music festival, as has happened this year, also has its charm. 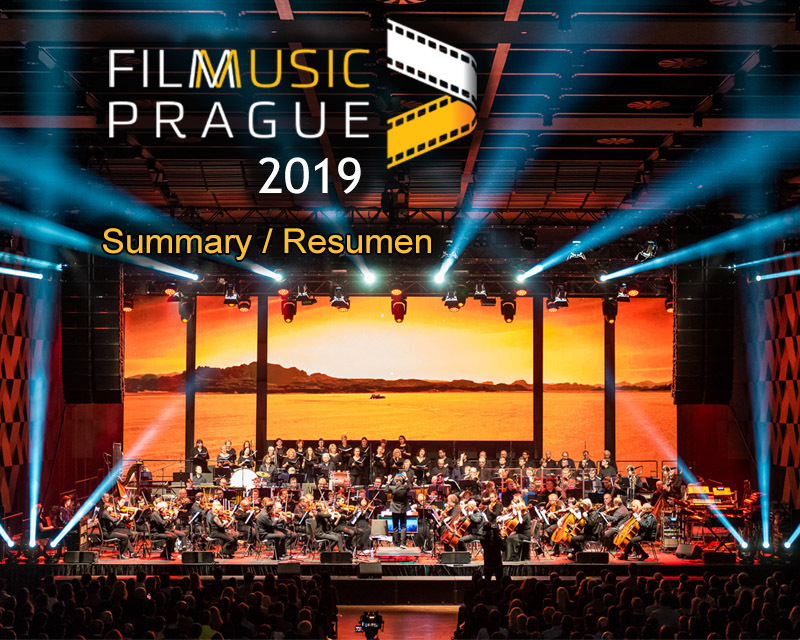 In summary, Film Music Prague 2019 has been a complete success, and an important qualitative and quantitative leap compared the 2018 edition. A better organization and planning of all the events has been noted, as well as a greater attendance at the festival both by fans as well as by industry professionals. It is clear that the festival is growing and it is doing it in a good direction. 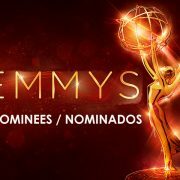 But the festival needs to be careful not to grow excessively and lose their identity; the identity that characterizes it for offering a different and original program. Sometimes less is better, and this can be a clear example. 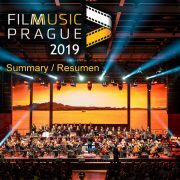 Film Music Prague 2020 has already set the dates for next year (read news), and soon it is possible that it will begin to announce guests and program, so I strongly recommend you to follow up on the next edition, because if it maintains at least the same quality level of this year, something that I have no doubt it will do, is an event that you should not miss.